Brachytherapy is an important mode of breast cancer treatment; however, improvements in both treatment planning and delivery are needed. 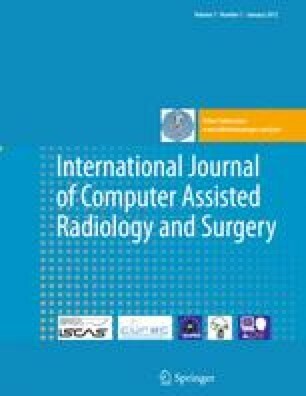 In order to meet these specific needs, integration of pre-operative imaging, supplemented by computerized surgical planning and mathematical optimization were used to develop and test an intra-operative immobilization and catheter guidance system. A custom template specific to each patient with optimally placed guide holes for catheter insertion was designed and fabricated. Creation of the template is based on a virtual reality reconstruction of the patient’s anatomy from computed tomography imaging. The template fits on the patient’s breast, immobilizing the soft tissue, and provides pre-planned catheter insertion holes for guidance to the tumor site. Agar-based phantom and target models were used for quantitative validation of the template by ascertaining the precision and accuracy of the templates. Tests were performed on agar-based tissue models using computed tomography imaging for template planning and validation. Planned catheter tracks were compared to post-insertion image data and distance measurements from target location were used to create an error measure. Initial results yielded an average error of 4.5mm. Once the workflow and template design were improved, an average error of 2.6mm was observed, bringing the error close to a clinically acceptable range. Use of a patient-specific template for breast brachytherapy is feasible and may improve the procedure accuracy and outcome.